One of the common frustrations for students trying to make sense of the various debates and concepts that inform contemporary educational and social science research methods such as structuralism, postpositivism, hermeneutics, and postmodernism is that most books introducing these topics are written at a level that assumes the reader comes to this material with a basic grasp of the underlying ideas. Too often, fundamental concepts and theories are presented without adequate preparation and without providing practical examples to illustrate key elements. When the first edition of Conceptual Foundations of Social Research Methods was published, it represented a sharp contrast with these other approaches and received much praise. In this revised and expanded second edition, David Baronov further develops his critically acclaimed treatment of the core conceptual tools of social research informing education and the social sciences, updating his discussion of the current literature, and adding a new chapter that explores the role of pragmatism. The book is organized around concepts and real-world examples that are drawn from, and relate to, a range of disciplines, including education, sociology, anthropology, political science, history, media studies, and women s studies. Indeed, an essential feature of this text is the author s judicious use of concrete examples from various disciplines to help walk the reader through complex ideas that are too often presented in overly abstract or theoretical language in other texts. The second edition is built around chapters addressing the topics of positivism, structuralism, hermeneutics, pragmatism, and postmodernism and is written in the same nontechnical, jargon-free style as the earlier edition. 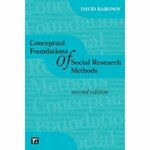 In addition, Conceptual Foundations of Social Research Methods provides readers with an expanded guide to the secondary literature for those who wish to pursue particular topics in greater depth. Already widely adopted by instructors across a range of disciplines, this second edition remains faithful to the earlier accessible and engaging style, while incorporating updated examples and a new chapter on pragmatism. Baronov, David, "Conceptual foundations of social research methods" (2012). Fisher Bookshelf. 4.